This is the year of the fairy-tale adaptation, from dueling Snow White movies to Grimm and Once Upon a Time. 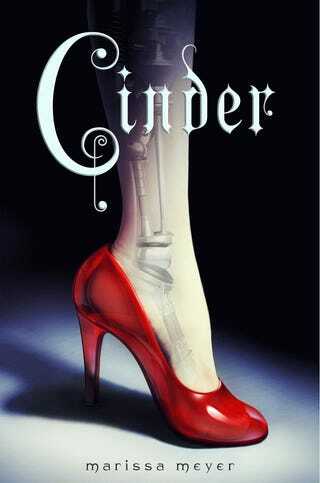 But quite possibly the most memorable take on fairy-tale archetypes isn't on any screen yet — it's Cinder, the cyborg Cinderella story by new author Marissa Meyer. There's a reason we're not seeing a flood of Cinderella stories on our screens to go with all the Snow White love — because Cinderella's a bit of a sop. Unlike other fairy tale heroines Cinderella doesn't fight a witch, or trek in the woods or break a curse or even just run away. There are no questions of legitimate succession as in other princess stories. She's just a sweet girl with a rotten home life who succeeds with minimal magical (or ghostly if you're a purist) intervention. Which makes Cinder, the tale of the best mechanic in New Beijing and a cyborg to boot, so refreshing. Sure there's a ball and a prince, but there's also an evil Lunar Queen and an incurable deadly plague. 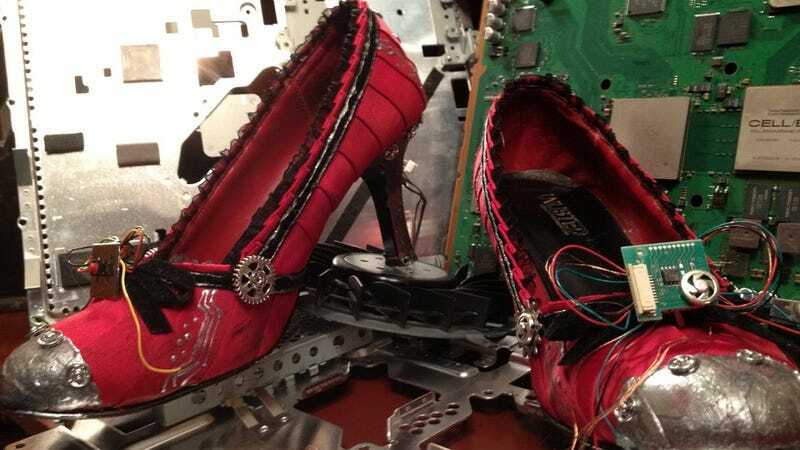 Top image: Cyborg red shoes by Shannon Writing and Rewriting. As a cyborg, Linh Cinder (the book uses Eastern order naming conventions) is legally an object and faces widespread prejudice. This keeps her in servitude to her "stepmother" who was left with her after her husband adopted Cinder and then died. Cinder's stepmother and sister Pearl treat her like an unwanted machine, but depend on her mechanic business for their livelihood. Cinder's android Iko and younger sister Peony are her only friends. Cinder also has no memory of her real family, or anything that happened before she awoke from surgery at age 11 with her shiny cyborg parts. Then Prince Kai brings an android into her shop for repairs and Peony catches the deadly plague. Cinder is drawn into the world of interplanetary politics via her flirtation with the prince. She's also "volunteered" as a plague test subject by her stepmother. Kai is facing his own difficulties. With both parents recently dead from the plague, the Lunar Queen Levana has decided to visit pushing her matrimonial agenda. Lunars are generally viewed with suspicion and hostility, and once you meet Levana you know why. Lunars have "bio-electric" capabilities, like the ability to look more attractive, make people feel things and in the case of Queen Levana calm angry crowds, which Earthens basically think of as magic. All of these additions aren't just there to add sci-fi flavor to the same plot. Cinder spends most of the book refusing to go to the ball. Along with trying to hide her cyborg nature from the prince and hoping that a cure can be found for Peony, Cinder plots her escape from her stepmother and New Beijing. Just as soon as she gets her foot back. She's helped, not by a fairy godmother who transforms mice, but by the possibly deranged medical researcher Dr. Erland who gets Cinder a secret bank account (and a few other things). His past is as mysterious as Cinder's, while his knowledge of Lunar society is surprisingly thorough. She's also helped by Iko, her fashion-obsessed android friend with a malfunctioning personality chip. The book reminded me, thematically at least, of a Heinlein juvenile. A tough minded, talented individual wants his/her freedom, but may have to save the universe on their way to getting it. It also had the same sort of bouncy optimism (though fewer lectures on slide rules). It's not as dark as a lot of the YA fiction that becomes popular among adults, but I don't think that's a bad thing. I wish we'd seen a bit more of Cinder's mechanical (if cyborg enhanced) abilities. A sub-plot about a presumed dead Lunar princess spools out pretty much as you'd expect for a book whose protagonist has a mysterious past. But by the end, the book had taken such a different turn that I wasn't put off by it. It's not every girl who'd be pissed off to learn she's a princess, but it's not every girl who'd build her own carriage to go to the ball either. Cinder is the first book in The Lunar Chronicles, a planned four book series about the impending war with the Lunars. Each book will retell a different fairy tale (book two will focus on a fighter pilot "Little Red Riding Hood"). As a set-up, Meyer manages to tell a satisfying story while putting in place the pieces for the rest of the series, an impressive job for a first novel. If you, or a teen you know, is looking for a science fiction book with a fun heroine and some cool new twists on a classic, Cinder should be high on your list. Cinder is out now from Feiwel and Friends, an imprint of Macmillan.